The date was Friday November 19th. That meant that it was parent–teacher conference day, but more importantly it was the last day of the 2010 whitetail hunting season in New York State. I had hunted extremely hard and already had two does in the freezer. I had passed on a few nice bucks with between 100 and 110 inches of headgear, but they didn’t meet our quality deer management guidelines. I had also had a couple close encounters with some shooter bucks, but simply couldn’t make it happen. As my body sat in my classroom meeting with parent after parent my mind was miles away sitting in my tree stand visualizing a gorgeous whitetail buck lurking dangerously close to me and my Mathews Z7. There was no doubt in my mind that I was heading straight to the woods as soon as my conferences were over; regardless of how much daylight I had left to hunt. I was born to bow hunt and I needed one last sit before the long wait until next bow season began. At 2:30 I received a phone call informing me that my last conference of the day was cancelled. Immediately, I began to feel like today just might be my lucky day. I’m a big believer in fate and to me this was an obvious sign that I was going to put some bone on the ground, tonight. I was out the door by 3:00 and I immediately pulled up the weather on my cell phone. I quickly scanned the forecast and with a North wind I decided to hunt my 20-foot ladder stand located right on a pinch point of Mud Creek and the edge of a field I call the "L" piece. By the time I arrived at my hunting property my excitement level was through the roof. At the same time I was almost overcome with sadness, knowing that this would be the last time I would go through my bow hunting routine. As I stepped out of my truck and began prepping myself for the hunt and made sure to take in every precious moment of this final hunt. I soaked myself in "Scent-a-Way" fresh earth spray in an attempt to negate the fact that I wasn’t able to shower between work and the hunt. As I grabbed the wooden grip of my precious bow and began my silent trip to my stand I couldn’t help but notice what a perfect evening it was. The temperature felt just right, there was very little wind, and the sun looked as beautiful as ever. I quickly reflected on how lucky I was to be in this moment and knew that I would leave those woods feeling lucky and grateful regardless if I had a deer dragging on the ground behind me or not. As I crept into my stand and scanned my surroundings my instincts told me that deer would be moving tonight. The only question was whether or not they would be moving by this stand. As I always do, I pulled out my wind indicator and gave a few puffs of white powder into the air. The powder doesn’t lie and unfortunately it drifted to the north, which meant that there was a south wind. How could this be? I checked the weather and I was certain that it had said there would be a north wind tonight. This was not good, not good at all. Although I had doused myself in scent-a-way the lack of a shower meant that I absolutely did not want the wind blowing my scent directly across the path I anticipated deer to be traveling on. I pulled out my phone and checked the weather again. Unfortunately, in the frenzy to get to my stand I had mistakenly looked at tomorrow’s weather. I quickly decided that it was too late to move and accepted the fact that my chance of scoring a big buck had just greatly decreased. Being the nature lover that I am I decided to sit it out and simply enjoy the beauty that surrounded me in every direction. I knew that my best buddy was also getting in one last hunt so I quickly texted him, explained my blunder and wished him luck. As I put my phone away I scanned the woods to my left and then the field to my right, and thought to myself, "Is there anywhere on earth more beautiful than upstate NY during the fall?" Personally, I think not. As my mind whirled with thoughts my daydreaming was interrupted by the sound that every bow hunter loves to hear, the sound of a snapping twig on the ground. My senses instantly guided my eyes to the location of the sound. It came from roughly 40 yards away to my left. I froze and waited. Moments later the culprit appeared, directly downwind from where I sat. It was a gorgeous doe and lucky for me I had another doe tag in my hunting pack. As I debated whether or not to send an FMJ arrow through her vitals I heard an even better sound than the one this doe had given her position away with. The second sound I heard was the sound that every bow hunter dreams of, it was a deep, throaty grunt of a buck hot on a does trail. The doe was now frozen 30 yards directly in front of me and I slowly peered back down the trail she had just come from. There he was; the buck that I had been fantasizing about all day. I didn’t waste any time drooling over the rack, I knew he was a mature buck and if he presented me with the opportunity I was going to harvest this majestic creature. I slowly eased my way back behind the tree and tried to relax. I knew that the key to me putting this buck on the ground was standing frozen 30 yards in front of me. I knew that if this doe continued past me into the field off to my right, the buck would follow. I sat as still as humanly possible and waited for the doe to make her move. I felt as if she knew something was not quite right, but she also knew she had a big buck trailing close behind with one thing on his mind. After what seemed like an eternity she put down her head and slowly continued walking toward the field edge. As soon as I was confident that her eyes were off of me I ever so slowly slipped my fingers through my wrist strap and gently grasped the grip of the Z7. It felt as if it were handcrafted to fit the contour of my palm and fingers. My heart was now beginning to beat like the heavy pounding rhythm of a drummer boy headed into battle. Finally the beast showed himself as he slowly trudged down the exact same path as the doe he was pursuing. As he crossed my scent line he came to an abrupt stop and his eyes shot directly at me. It seemed as if he was burning a hole through my soul and I feared the worst. I sat more still than I ever thought possible and didn’t breath for what seemed like minutes. I sat and waited. At any moment I was sure that he would bound off flicking his whitetail in my face, taunting me and leaving me with a full year to dream about what could have been. Just when I thought I couldn’t take it anymore, my prayers were answered. He wasn’t able to pick me out of the trees and his mind drifted back to the doe he was shadowing. As soon as he dropped his head and trotted in her direction I raised my bow, drew, and anchored just as I practiced all off-season. He waited at the field edge much longer then I anticipated and my muscles were beginning to flood with lactic acid. I knew that my arms would have to explode before I would let down my draw and risk spooking the buck of my dreams. Finally, the statuesque beast began to move again. All I needed was five more steps and I he would present me with a perfect 36-yard broad side shot. It was almost as if I wrote the script and this buck wanted the part badly. As he took the last step I needed I gave a low grunt of my own and he stopped dead in his tracks. I barely remember releasing the arrow, but what happened next will be engrained in my mind until the end of my days on this earth. No sooner had I released my full camouflage FMJ arrow, equipped with a 2 blade Rage expandable broad head, and the buck from my daydreams was on the ground. When the arrow penetrated his body the massive cutting diameter of my Rage had hit the top of his lungs and also clipped his spinal cord. He dropped like a ten-ton brick. I was extremely excited that the buck was down but I despise seeing an animal suffer, especially if it’s by my hand. I quickly grabbed one more arrow from my quiver along with my bow and scurried down the ladder. As I came down the ladder the buck mustered every inch of strength that he had left and managed to get to his feet. As my feet hit the ground the buck started stumbling away from me as fast as his damaged body would allow him to go. I was literally running alongside this buck step for step as he tried to escape fate. I only had on arrow with me and I knew that I had to make this shot count and give this buck the quick death that he deserved. We were rapidly approaching Mud Creek and as my prey hit the water he couldn’t support himself anymore and he plummeted down into the 3 feet deep creek. I knew this was my chance and I knew I had to make a quick shot to finish him off. I approached the downed buck and stood directly over his body as I drew back my bow. I settled my pins on his vitals and sank the arrow into his muscular body. Immediately I knew it would all be over within a matter of seconds. The creek ran red with his blood. Then unexpectedly something happened that changed me forever. With two fatal shots already having pierced this incredible animals body he stood one final time. There we were face to face in the middle of the creek. Literally, three feet separated this buck and myself. The animal turned and stared directly into my eyes. A very primitive feeling overcame my mind, body and soul. Many people in our society have become disconnected from our roots as hunters and gatherers. This event brought me much sorrow but also the reality that this is what man was meant to do. I can promise you that not one bit of this animal’s body would go to waste. He was about to give his life to feed my family and for that I would be eternally grateful to him. I could see in his eyes that he knew the end was near. I could see his fear and I truly felt the deepest sorrow I have ever experienced watching this animal except his own death. As he fell to the ground for the final time I approached the animal, placed my hand on his head and prayed for him. I prayed in thanks and also for forgiveness for taking such a beautiful creature from this earth. As I prayed I felt his life slip away beneath my fingers. Finally, it was over. I grabbed my deer and dragged him to dry land. From the time I released my first arrow until the time this buck took its final breath only 4 minutes had passed, but it truly felt like an eternity. I propped him up against a log and immediately headed back to my stand to grab some of my gear and replay the craziest hunt I had ever personally experienced. As I walked back I called my buddy to give him the good news. He immediately asked me how many points the buck had, but I hadn’t even checked yet. I told him the points didn’t even matter to me but I did tell him that he was a beautiful mature buck. Finally, I did arrive back at my buck’s side and investigated his rack and the rest of his body. He was at one time a 12-point but he had busted off his G2 on the left antler, which made him an 11. His body was stunning; he looked like a thoroughbred horse in its prime. I have never been more proud of an animal that I harvested. As I dragged my buck out of the woods towards my truck everything seemed so surreal. Did I really just harvest a 127-inch whitetail on the last day, during the final hour of the 2010 bow season? As hard as it was to believe, it happened. All the hard work had paid off and I couldn’t have been more proud. Not just of myself, but of my entire hunt club. Me and the other three members of my hunt club had worked hard all off-season in preparation of archery hunting. 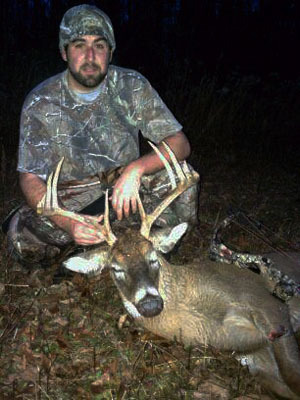 Between the four of us, Wes Hopkins scored a 121-inch whitetail along with a doe. Jamie Anderson, my best friend since age 8 had shot his first big buck and on my property. His buck was a beautiful 8-pointer that scored 116 inches and he also harvested a mature doe. Shawn Mizro, the newest member of our hunt club unfortunately came up empty handed but most certainly not due to lack of effort. He worked hard, hunted hard, and soaked up as much knowledge as possible. I am certain that success is in his near future. I had been lucky enough to harvest two does and on the final night put down my beautiful 127-inch buck. Every time I enter the woods to hunt I leave with more knowledge then the hunt before. I felt like after this hunt I had learned more than any other hunt in my life. It’s important to never give up regardless of how much time is left on the clock and never panic. As a hunter you need to practice as much as possible and when the moment of truth comes remember what you practiced. It’s very easy to melt under pressure and forget everything you have trained yourself to do. If you allow yourself to succumb to the pressure, that is when you usually leave the woods asking yourself, "What went wrong?" From one hunter to another, never give up, stay true to yourself, and have confidence in what you are doing. More important than all else respect the animals you hunt and give thanks for their sacrifice.